This week will see the unveiling of a revolutionary new small cells fiber optic cable and connector system CTIA Super Mobility Week in Las Vegas. HUBER+SUHNER, one of the world's leading connectivity specialists, will show, for the first time anywhere in the world, its new MASTERLINE Ultimate SC solution - a highly compact fiber optic cable system that is both easy to deploy and plug-and-play, an ideal solution for the next generation of remote radio heads. The MASTERLINE Ultimate SC can be used as a single point of deployment for up to three or four small cells and also has the ability to daisy chain fiber out of this unit and actually add more and more nodes to a solution or to a network as the operator grows the infrastructure. 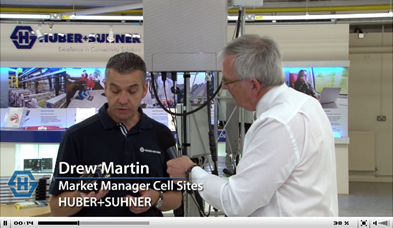 Furthermore with the integration of Cube Optics, new key technologies in miniaturized transport cubes complete the HUBER+SUHNER small cell solution, unleashing new fiber capacity and resilience to all small cell deployments. HUBER+SUHNER will also showcase its extensive portfolio of IBC/DAS (Distributed Antenna Systems for In-Building Communications) indoor antennas, including the SENCITY Rondo, which will be shown for the first time anywhere in the world. The SENCITY Rondo antenna is omnidirectional and multiband, covering almost all LTE frequency bands and beyond. In a further exciting revelation at the show, HUBER+SUHNER will demonstrate a revolutionary new Quick-Fit plus connector system that will dramatically reduce the time required to assemble and deploy cables and connectors for IBC/DAS applications. The solution covers a wide range of cables including the plenum cables used in the US market. HUBER+SUHNER is the market leader for Fiber to the Antenna (FTTA), Power to the Antenna (PTTA) and Hybrid to the Antenna (HTTA) infrastructure for installing Remote Radio Heads. With an extensive radio frequency, fiber optics and low frequency portfolio the company has already made significant contributions across a range of industries. Visitors to CTIA Super Mobility 2015 can discover more about HUBER+SUHNER's Quick-Fit plus solutions, IBC/DAS and small cells solutions in Las Vegas from 9-11 September 2015 - Booth 4132. 0 comments on "Small Cells on Parade at HUBER+SUHNER's CTIA Super Mobility Booth"